When I think of Mardi Gras, I think of the first time Tres took me to New Orleans. It was a trip of fun, food, drinks and parades, but it was also the first time he introduced me to his grandmother. Tres mom and dad both grew up in New Orleans, and at the time, his dad's mom still lived there. When I met Mawmaw she was in her late 80s and had lots of stories to tell of Mardi Gras and the "wicked city" (as she put it), of New Orleans. A couple of years later, Tres and I got married in New Orleans and a few months after that we attended MawMaw's 90th birthday party. She is no longer with us, but many times when I think of Mardi Gras, I think of her. 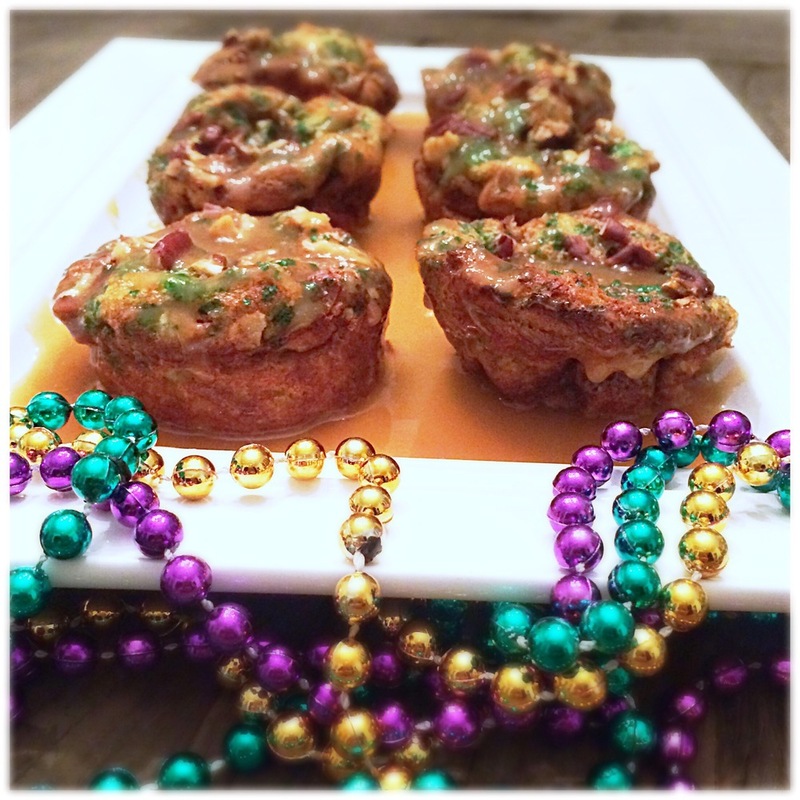 Because King Cake is the "king" of Mardi Gras, I thought why not make another NOLA favorite from it: bread pudding! 1. Whisk the eggs, milk, cream, brown sugar, cinnamon, nutmeg and almond extract together in a large bowl. Add the cubed King Cake and let sit for at least one hour. 2. Preheat oven to 350 degrees. Prepare a 12 cup muffin tin by spraying the inside of each cup with cooking spray. Spoon the mixture into each cup, 3/4 of the way up, being careful to not fill completely to the top. Sprinkle with the pecans and sprinkles. Bake for 15-20 minutes until custard is golden and set, being careful to not overcook. 3. Make sauce by whisking together the butter, brown sugar, whisky, corn starch, and salt in a small saucepan over medium heat. Let come to a slight boil and simmer until thick. Pace the mini bread puddings on a platter and spoon the sauce over the top. CHEERS TO A HAPPY FAT TUESDAY!